These superb cacti only grow on the coastal areas of the Atacama desert in Northern Chile. 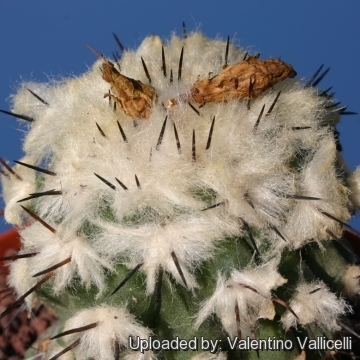 Origin and Habitat: Copiapoa esmeraldana grows in the Atacama desert in Northern Chile, Depart. Taltal (along the cliff's edge, overlooking the Pacific Ocean, high on the hills at Las Lomitas, an area just to the south of Esmeralda within the Pan de Azucar National Park). This species has a very restricted extent of occurrence of 35 km2, it is known from a single location at elevations around 600 metres above sea level. It is not abundant; there are probably 250 to 500 individuals. The individuals are usually isolated. Habitat: This species grows in the steep coast in granitic hills (lomas costeras), a few km. from the sea and there is heavy fog in the area. 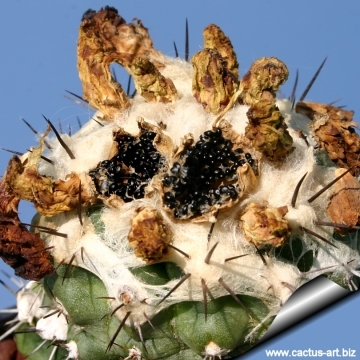 It grows along with Copiapoa laui, Copiapoa grandiflora and Copiapoa longistaminea. It is threatened by illegal collection, erosion, and predation from guanacos that is causing continuing declines. The guanacos seek out the dwarf cacti such as Copiapoa lauii and C. esmeraldana probably using their highly developed sense of smell. With their front hooves, they dig away the earth from around the plants, and devour the virtually spineless plants. 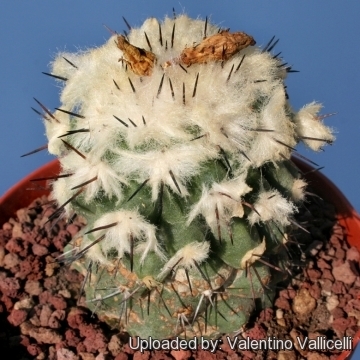 Description: The name Copiapoa esmeraldana, ( syn: Copiapoa grandiflora subs. ritteri) firstly described by Ritter in 1980, is considered by some authors to be a small growing geophytic and neotenous relative of Copiapoa grandiflora or a variation of Copiapoa humilis (Phil.) Hutchison (Hoffmann and Walter 1989). Taxonomic notes: The identification of the true 'esmeraldana' may concern a degree of uncertainty as to what this plant is. 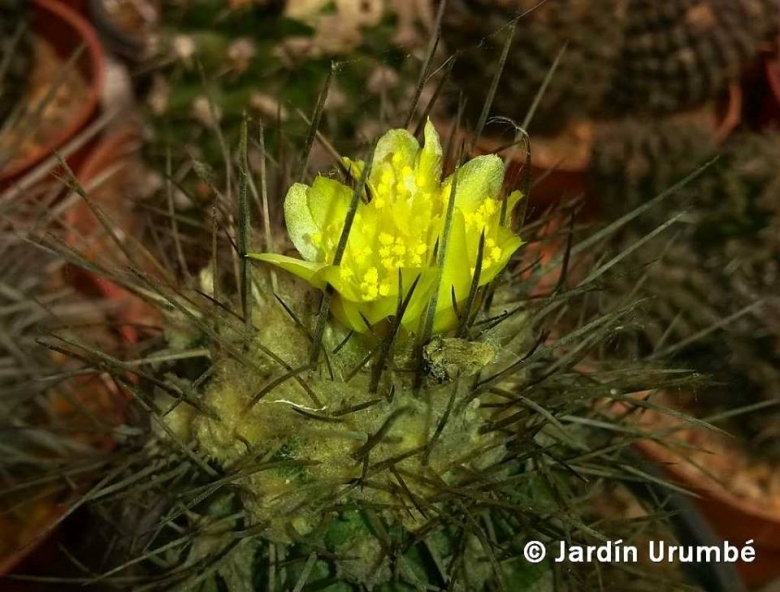 There is no doubt that it grows in the Guanillos valley near Esmeralda, together with some other Copiapoa species, but it is far from clear that it is Ritter's Copiapoa esmeraldana, although specimens have been cultivated under that name for some time. 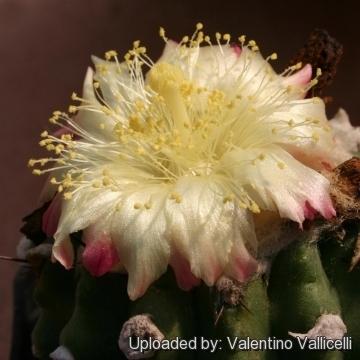 It is likely that the majority of the plants that have been called Copiapoa esmeraldana in the Guanillos Valley were probably small plants of Copiapoa grandiflora. 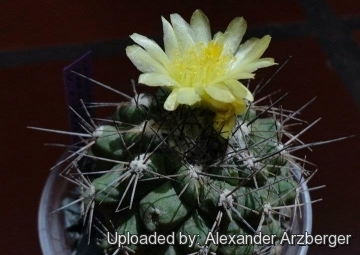 Alexander Doweld has recently made the combination Copiapoa grandiflora subs. ritteri (the species epithet "esmeraldana" being changed to "ritteri" at the rank of subspecies) which seems appropriate. Habit: Solitary or moderately prolific, eventually forming large clumps. Stem: Green, soft, succulent, globose, green to brownish, 3.5-7cm in diameter, apex depressed with white wool, particularly at flowering time. Ribs: 13-16, deeply notched, tuberculate, 6-10 mm tall. Areoles: 3-4 mm in diameter, apical, slightly dislocated in the lower part of the tubercle. 8-15 mm apart, covered with short whitish wool when young, later glabrous. Spines: Brownish to ash-grey, straight. 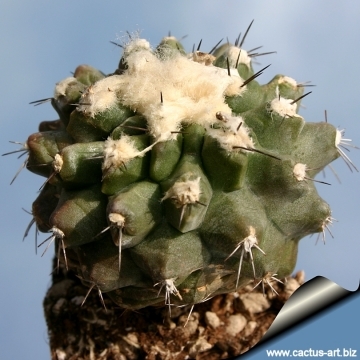 Yoong plants only have thin radial spines, while the centrals appear as the plants mature. Radial spines: 6-8 acicular, 5-10 mm long. Root: Large tap-root with a thin neck. Flowers: Yellow, campanulate, scented, about 30-35 mm long. They grow from the center of the white wool at the apex. Seeds: 1,5 mm wide, black. Copiapoa esmeraldana F.Ritter: (syn: Copiapoa grandiflora subs. 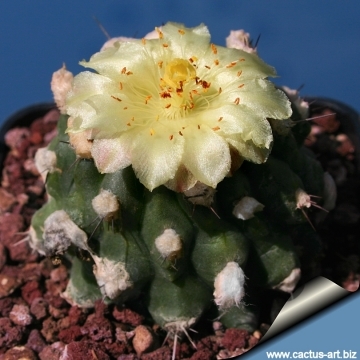 ritteri) is a small growing geophytic and neotenous relative of Copiapoa grandiflora. Distribution: Guanillos valley near Esmeralda. Copiapoa grandiflora F.Ritter: has green highly branched stems that form large, dense cushions up to 50 cm in diameter, and has large blooms. Distribution: Pan de Azucar to Cifuncho, also near Esmeralda. 6) Walter, H.E., Faundez, L., Guerrero, P. & Saldivia, P. 2013. Copiapoa esmeraldana. The IUCN Red List of Threatened Species 2013: e.T151989A584522. http://dx.doi.org/10.2305/IUCN.UK.2013-1.RLTS.T151989A584522.en. Downloaded on 27 August 2016. Cultivation and Propagation: Slow growing, it needs full sun but should be protected from excessive heat and sun in summer. Requires light watering and good drainage. Keep warm and dry in winter to avoid rot. It needs mild heat in winter. Avoid any frost.